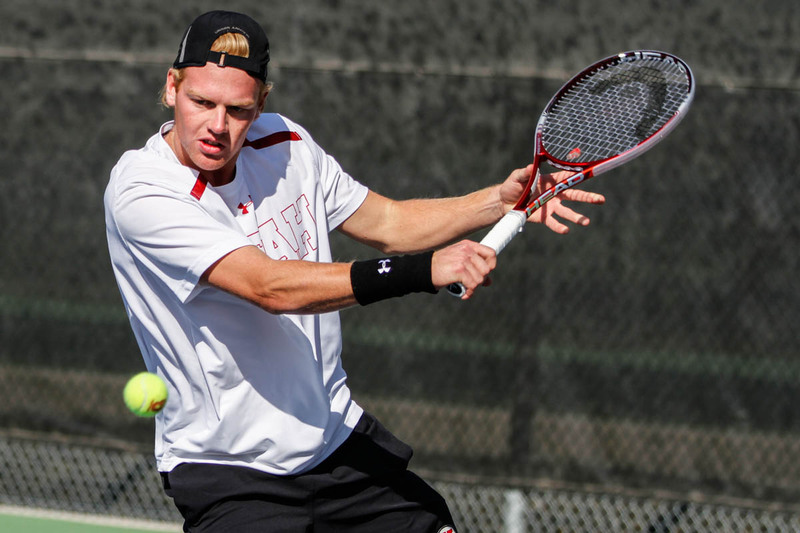 Lincoln, Neb – The University of Utah men’s tennis team (10-3) was defeated by No. 45 Drake (8-4) Saturday night, 7-0. After upsetting N0. 44 Nebraska on Friday, the Utes struggled to maintain the momentum. The Utes lost the doubles point to Drake after Lane/Taesevac were edged in a tiebreak. Drake quickly won at No. 2, 3, and 5 singles. Matt Cowley was the only Ute to win a set in singles play in a 6-4, 3-6, 10-4 loss to Mullis at the No. 6 slot. Cedric Willems also had a tight match at at the No. 4 spot, losing 7-6(2), 7-6(5), which sealed the sweep for Drake. Utah is back on the road next week and will play UNLV and No. 72 Marquette in Las Vegas, Nev. This entry was posted in Schedule/Results and tagged Alejandro Medinilla, Ben Tasevac, Cedric Willems, Devin Lane, Drake, Matt Cowley, Roeland Brateanu, Slim Hamza, Utah Utes. Bookmark the permalink.